It is true that all around the world the farming population is aging. I recently read that the average age of a farmer in South Africa is 62 years and in the United States it is 55. In a world where food insecurity levels are steadily increasing, this statistic should be cause for concern. We need to be asking questions beyond current debates about land ownership or access to land like: Where are the young farmers? Our country faces challenges with growing population, rapid urbanisation and climate change – who is being educated to become future farmers? Who will take care of the soils and the natural resources at our disposal for the sake of the future? Where are the young scientists and agronomists who will lead the way in research and development and in advancing agricultural technology? Who will be equipped to champion the farmers’ interests before policy makers and rulers? Also, if farmer numbers are declining then what will happen to job creation in rural areas? Who has what it takes to become a farmer? 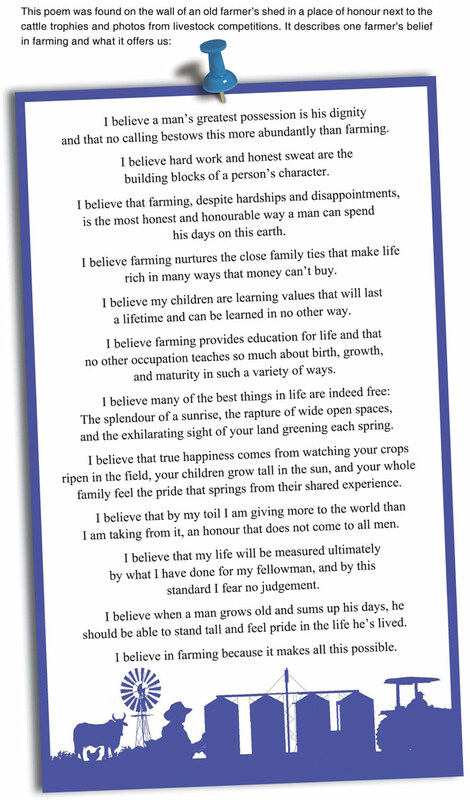 Farming is not just a job; it’s a way of life! If you are a farmer there is no such thing as working from 9 am to 5 pm. You are always ‘on standby’ – if a cow goes into labour in the midnight hours you monitor her throughout the calving process. If the rains are late you work in the fields from before dawn until long after dark to get the fields prepared, the seeds into the soil and the weeds sprayed. Sadly, too many people have lost touch with this way of life to know what a beautiful thing it can be to work as a family with the rhythms of nature. Are we doing enough to encourage the next generation about the importance of farming as a career and lifestyle? It is true farmers do work very hard and keep long hours in order to be successful…but that is ONLY one aspect of a multi-faceted career. Farmers lead a life of significance and purpose – after all, the work of farmers is necessary for human survival! Farmers are highly motivated and capable, multi-talented individuals who balance their chores from the field to the farm office to the agri-business environment with skill. They should be respected as professionals whose work is highly significant. Most farmers are driven by their love for what they do – most of them can’t imagine a life worthwhile doing anything else. It is this passion which gives farmers the strength to stand up and start again after a time of failure or disappointment. Successful farms are run by passionate farmers who breathe farming in every pore of their being! Pursuit of knowledge and eagerness to learn – to be successful, a farmer must know a great deal about his land and the products he plans to raise. Farming is not a stagnant environment. There are always new developments, farming methods, technologies to discover and learn about. A good farmer is a perpetual student who reads and talks to experts to soak up as much information as possible. Good farmers seek to constantly improve themselves and their business skills. A successful Illinois crop farmer Jeff Brown says: ‘You have to think outside the box and challenge what you do. Your crops will only grow as much as you grow!’ He says he is continually improving on the way he grows a crop by incorporating technology that has an economic impact as well as a positive environmental impact. Nobody ever said that farming was an easy career choice. A farmer often faces challenges and crisis situations which require some quick thinking and creative solutions. 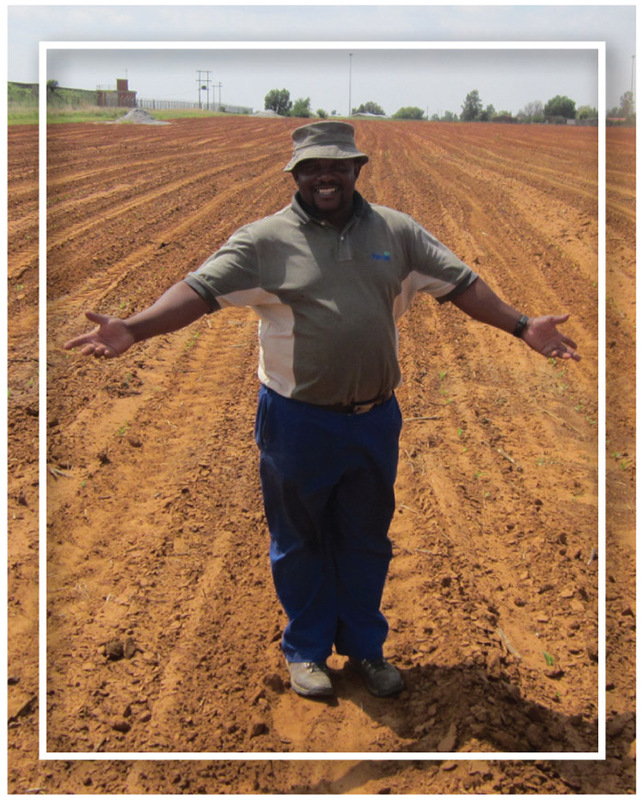 Farmers are proactive in their response to problems – there is even a slogan which says ‘’n Boer maak ‘n plan! ’ Farmers need courage to stare problems in the face and find solutions and have become known for their innovative thinking. This characteristic sets farmers apart from others who need a computer or a manual with a clear set of instructions! If you are a farmer there is always some context where you need to work in a team, either as a team member or a team leader. If you are the leader you need to be able to inspire and motivate people to believe in the common goals so they will do all it takes to achieve them. Recognising the value of every member of your team is key to your business success and instrumental in business growth and success. In farming it is also often the case that your team is your family. It requires wisdom and skill to keep the family team motivated and pulling together in the same direction for success and high productivity. Patience is necessary because a farmer’s reward comes slowly. There is no quick return or instant reward in farming. Just as the seasons turn slowly, so does a farmers job satisfaction – and if there’s a drought it’s an even longer waiting game. Sowing and harvesting are long processes. Breeding an excellent herd of animals takes time as you match bulls to cows and then wait for new calves to be born. Possibly the most essential characteristic of a farmer is having a never-give-up attitude. This is the mark of a successful farmer who will stay in the game for the long run. Patience, perseverance and passion make it possible to push through the challenges and failures.